In the lush highlands of the Caribbean island of Barbados is a beautifully preserved slice of history; St. Nicholas Abbey is a sugar plantation and rum distillery, boasting a Jacobean mansion built in 1658, beautiful gardens, and a richly preserved historical and cultural context that is expertly conveyed during tours of the house and property. Entering the grounds, the large trees and sweeping pastoral views are striking, leaves and grass gently blowing in the steady ocean breeze and lush greenery filling every corner of the gardens. The elegant house has been carefully restored, and while it shows a bit of its age in weathered paint, it is remarkably well-preserved even after hundreds of years in the tropical climate. Inside the house, details like a shell-encrusted chandelier and portraits of historic owners of the property add color to the stories shared by the tour guide. Walking through the home, the grounds of the plantation are glimpsed at open windows. After pausing in a quiet courtyard, the tour continued on to the rum tasting room. Originally the stables, this charming building has been renovated by the current property owner who also happens to be an architect, to house a museum, gift shop and tasting room. Here we lingered amongst the barrels and exhibits of artifacts, including slave records, before being shown a remarkable film of archival footage from the 1930’s detailing life on the sugar plantation. After our refreshments the tour continued on a leisurely walk through lush gardens to the bottling and production facilities. In the bottling and labelling facility, formerly the Overseer’s Quarters, rum bottles are hand labelled and the corks adorned with a leather badge, stamped in-house. The factory and adjacent distillery includes displays of equipment for growing and processing sugar cane, and for the production of rum. The architectural details and dedication to preservation found throughout the property were remarkable, and one of the nicest surprises were the remnants of a large windmill behind the factory, where workers were piling cane for processing. After the tour ended, we wandered the grounds, basking in the highland breezes and balmy sunshine. Artifacts are cleverly incorporated throughout the gardens, offering some unique photo opportunities. 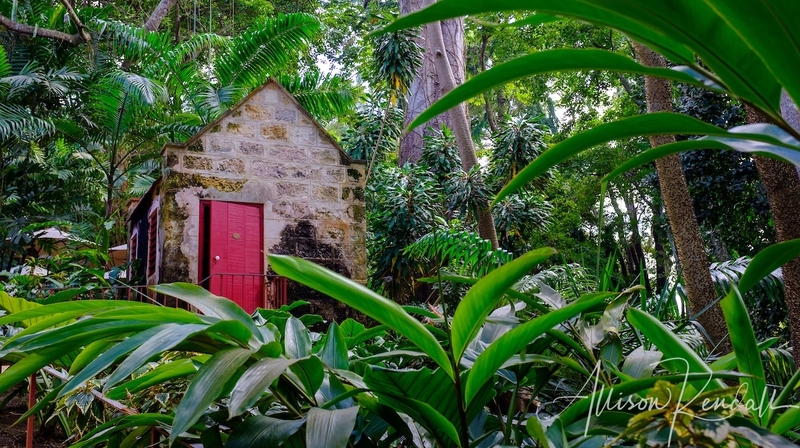 I absolutely recommend a visit to St. Nicholas Abbey in Barbados, not only is the rum delicious but the opportunity to enjoy a close-encounter with the rich and varied history of Barbados is placed front-and-center when one takes a guided tour of the plantation property. This is a travel destination apart from the typical crowds closer to Bridgetown, and a strong sense of hospitality and pride in the place and product is very apparent. *As a footnote, this is the first batch of images I am sharing from my new Fuji X100F, for which I could not resist using the Velvia film simulation when editing. While I continue to shoot with my full-frame Nikon D800 dslr, I wanted a smaller camera for travel, and so far the Fuji X100F has exceeded all expectations. After a few more trips, I hope to share some tips and a full review of the camera. Wow, I absolutely love your photos of St. Nicholas Abbey, the quality is amazing and you’ve captured some very interesting perspectives. My favourite is the one inside the old windmill looking up at the blue sky. Thanks for sharing.